When we approached Hasbro to seek sponsorship for our SG50 August Giveaway, little did we know that they would throw a challenge to us in return. So they sent us their Super Color Pack that consist of 20 tubs of Play Doh of different colors and a note saying "Using Play-Doh and Food Creations, relate back to SG50 by creating models of food in Singapore such as satay, ang ku kueh etc." We were stunned like ve-gee-table... and took us a few days to think about the theme. Well, the easy part is the food that is so Singapore because we are a family who love food but the real challenge is in the making of it. How to mould and shape it to look like what it was suppose to look like. Feeling rather amused than frustrated, I did not give up, many different type of food flashed through my mind such as laksa, Hainanese chicken rice, char keuy teow, fried carrot cake etc. Then I tried to make satay, very simple right? Not so simple to make it... the end product looked like something else that is not so pleasant so they have to be ditched *sigh* And then I remembered one of my favourite snack, the pig's ear biscuits! This time I am determined to make it right, I mixed 2 different shades of brown, roll them out, slightly flatten them and roll it up like a pinwheel then push the centre upwards to make a concave shape. Not bad eh? Success finally! 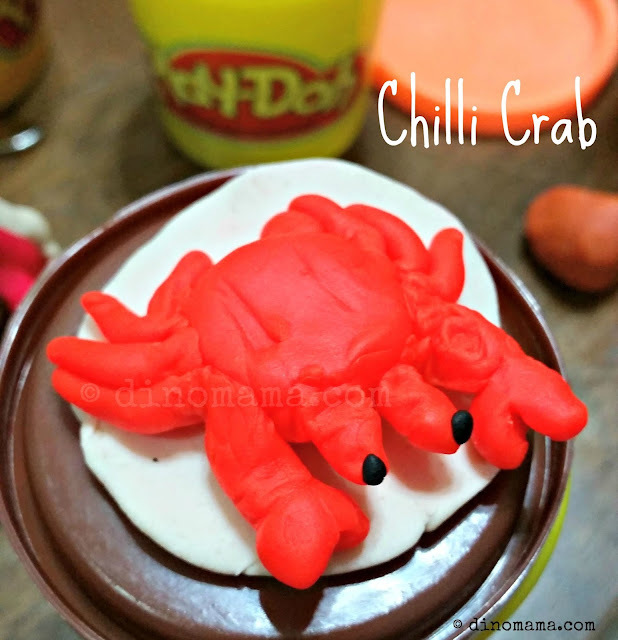 And while I am doing mine, DinoBoy also tried his hands in making some food too. 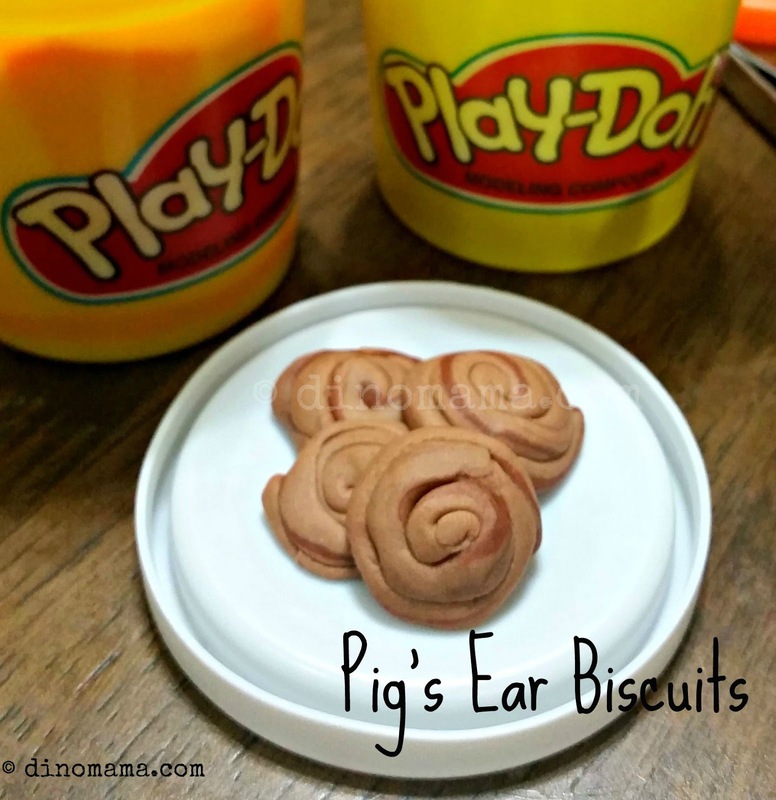 He loves Play Doh and has been playing with them since he was younger, he is an expert in this area. Look at his cheese burger, looks good right? 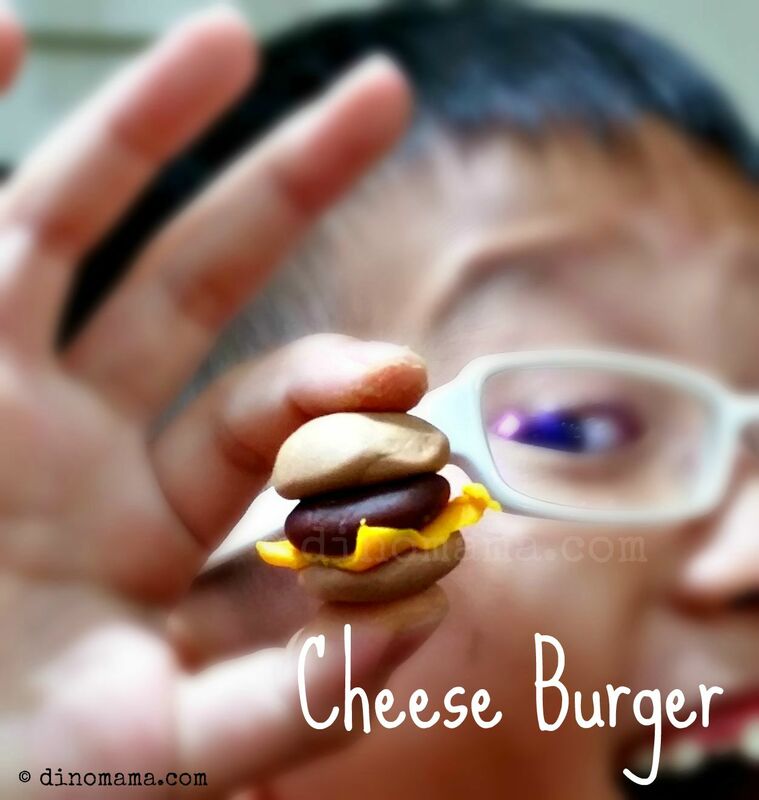 I told him cheese burger is not a food that represent Singapore, he protested and said "But MUM! IT IS because every one's eating Mcdonald's cheese burger!" 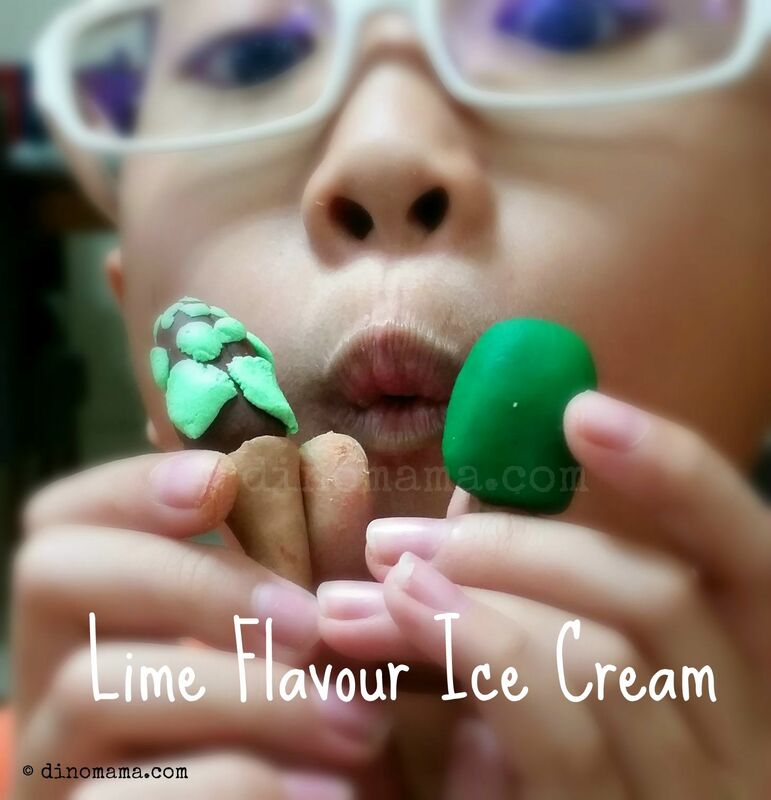 Next he made ice cream, those milk ice cream coated with frozen lime flavoured ice or Splice ice cream and chocolate mint ice cream cone. 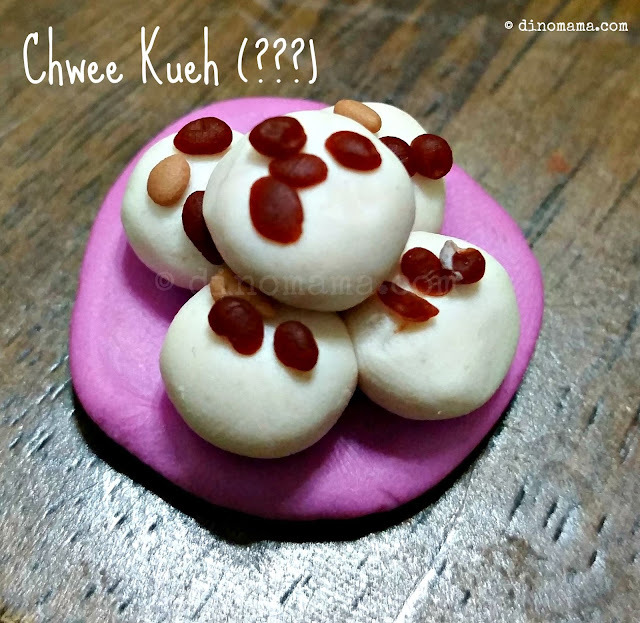 Again, nothing Singapore related but I guess these are his childhood snacks and titbits which weren't a lot since we sort of control on that. 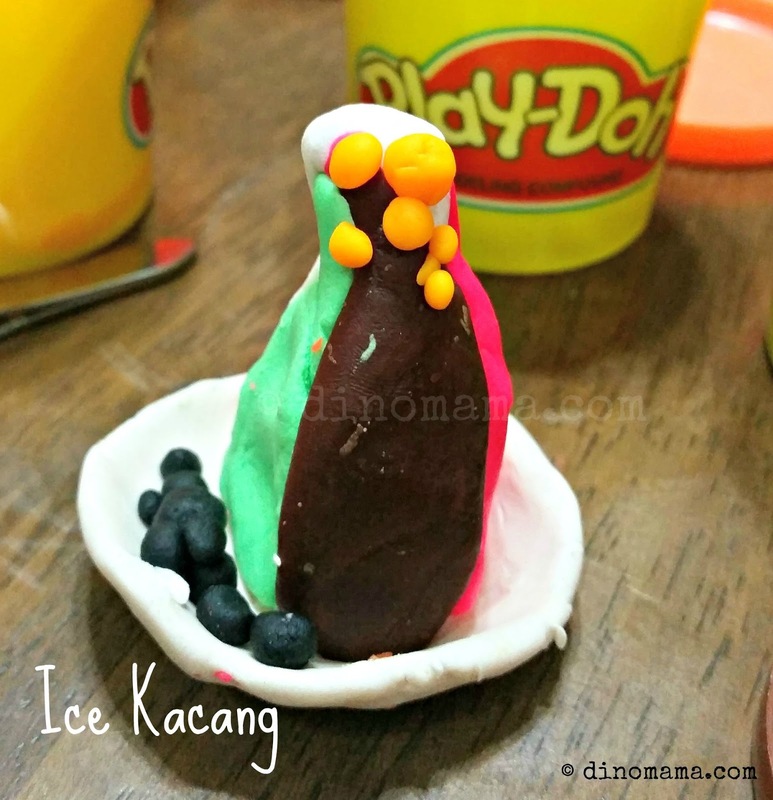 I merely commented that he is not making any "Singapore Food" and he made this, his favourite dessert - ice kacang. As you can see, he did it half way, so few corns and then only 1 colored cubed jelly... where are the red beans, attap chee or attap seed, the red and green cube jelly? 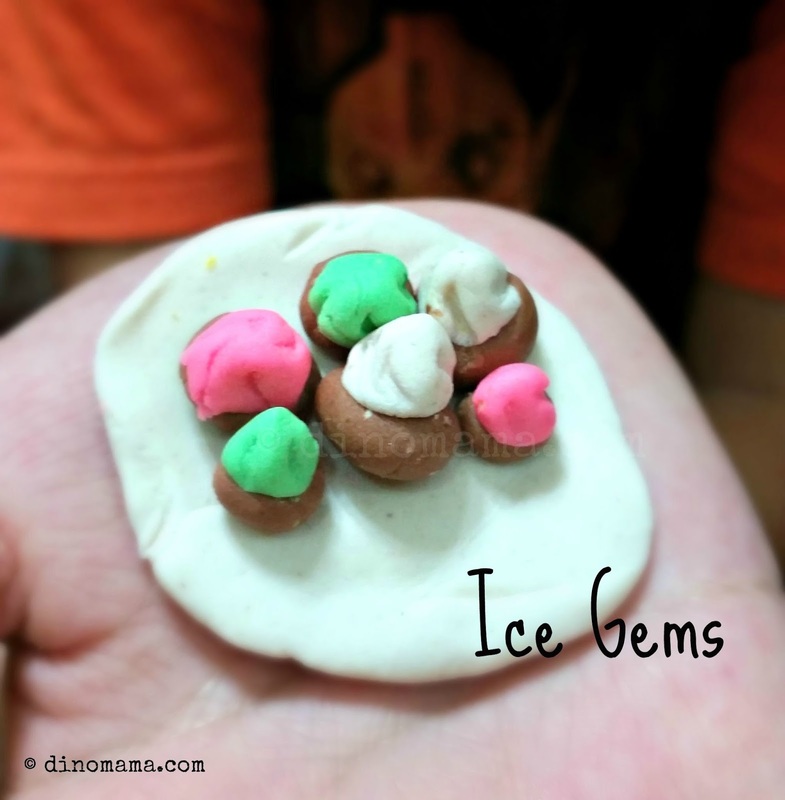 Later, I pointed to a packet of ice gems on the dining table and said "Perhaps we could do that but how should we do the colorful icing?" I left him to try and do it while I take photos of our creations. Minutes later he presented these to me! See, I told you that he's better in this than me, they look pretty close to the real thing. - Winners will be picked randomly. - Winners will have to collect their vouchers at PONEY flagship boutique @ Marina Bay Sands. - Winners will be notified in their shared post of our giveaway. So remember to share you post as "Public". - Winners will have 48 hours to respond by replying to our notification otherwise, a new winner will be picked. - Only one winner per household. 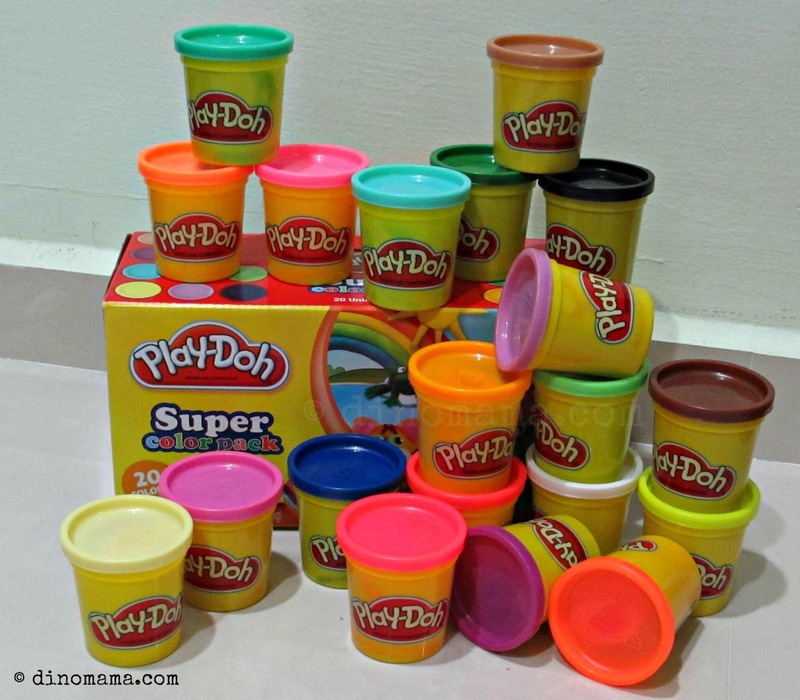 Disclaimer : We were given a set of Play Doh Super Color Set from Hasbro for the purpose of this post and giveaway, no other forms of compensation were received. All opinions are 100% ours and all photos in this post unless otherwise credited, are copyrighted and belongs to the DinoFamily, you may not use any of the photos for any purposes without seeking our approval. scrambled egg, sausage & hash brown ! On most days, it is simple, humble kaya or peanut butter on bread. My entire family love this! Peanut Porridge with You Tiao! Not forgetting my coffee before I start my day! Hotcakes with maple syrup! Yummy! Milo, bread with kaya or cracker with peanut butter.... on the rush. Fried bee hoon with luncheon meat ! black carrot cake. we always request to have it more black and in small pieces. yums! I like sinful breakfast. Economy fried bee hoon mix with noodles, topped with a sunny side up and a slice of fried luncheon meat. Yums. toasted bread with butter and sugar on it! Fried beehoon with luncheon meat! Traditional Sugar Doughnuts, my younger day till now.. The common breakfast that my family had is century eggs + pork porridge with youtiao.